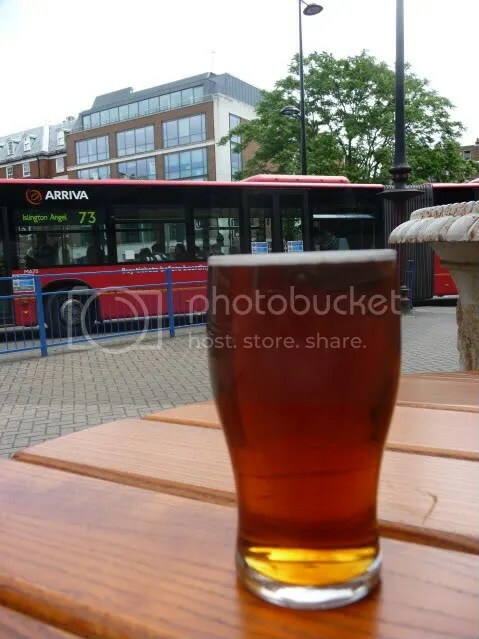 Advent Calendar #6 – Save the pub landlord! Today I link to an article in the Spectator. Ted Goldsmith Points out that there is a good reason for many pub closures – they were dreadful. A landlord can preside over civilised ambience — with proper beer, no fruit machines and chairs made for comfort — or he can pump dance music through the stereo and offer two-for-one shots of Jagermeister to punters seated on working recreations of medieval torture devices. Of course, some pub ‘managers’ are only obeying orders — but really good pubs are run by people who know what they are doing and can call the shots. I aim to publish short daily pieces during December, let’s see how it works. As a side interest, this book was successfully crowd funded, but that should not distract you from the contents. This is about how Britain created the first global drinks. The India Pale Ale is in it, obviously, and I don’t know how this retelling will hold up to the scrutiny of historians like Martyn. But what caught my interest was the story about Sir Kenelm Digby, the inventor of the modern wine bottle. It made possible the production of champagne, but they started out as bottles strong enough for sparkling cider. The cold climate made it impossible to make domestic wine, and wars with France, Spain and the Netherlands put a stop to imports. Cider was then embraced as a substitute. You can read this fascinating chapter online. Other members of the Royal Society in London took an interest in apple growing, cider making and putting fizz in the bottles. The greatest minds in the country turned themselves to perfecting this home-grown product. It was soon noted that the bubbles would be all the more vigorous if extra sugar was added to fuel the secondary fermentation. John Beale from Herefordshire cider country and formerly of King’s College Cambridge read a paper to the Royal Society on 10th December 1662 in which he describes putting a ‘walnut of sugar’ into bottled cider. This is about 20g of sugar, roughly the amount of sugar (‘dosage’) added to modern dry champagne. You can buy this from amazon, but the authors Unbound page offers more alternatives. No time for writing up any comprehensive blog posts on pubs, beer shops or the general feeling of being back in London in December once more. 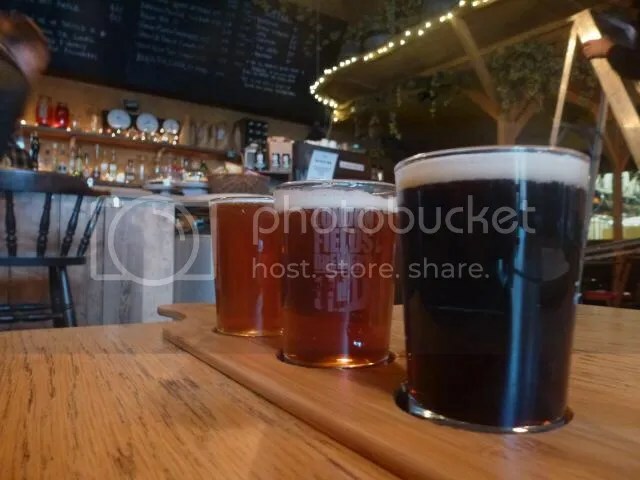 It was a nice unpretentious weekend with two mates, and, while we tried to cover quite a few pubs, we did not aim for a maximum number of beers or breweries. The choice is staggering compared the London I used to know, perhaps I’ll try to come back and cover it better in the future. And our Facebook friends got live coverage the weekend we were there…. The London Fields brewery tap. After passing two pubs that did not open until four in the afternoon, this was a great place to end up. Nine beers on tap, including some one-offs, and you get 1/3 pint samplers at a reasonable price. Industrial/punk style, concrete, glass and plywood. There are windows between the tap room and the brewery. Relaxed on a Friday afternoon. 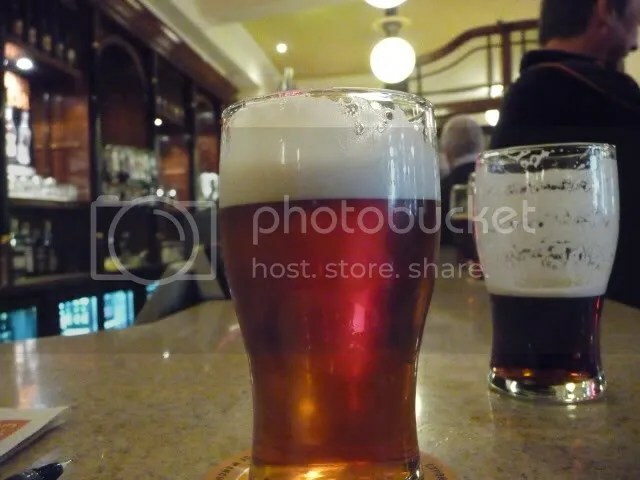 Good beers, we particularly noted that the quality was consistent across the range. Impressive from a newcomer. 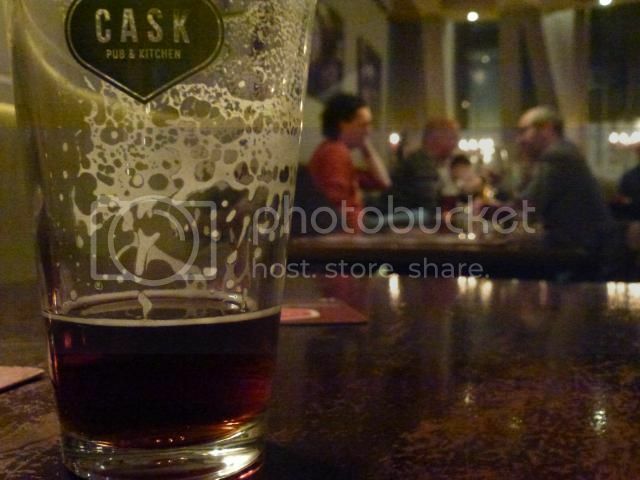 A return visit to the Cask Pub and Kitchen, good food and a great range of beers. A Saturday evening visit to the sister establishment, Craft Clapham, which was quite insane. It was the night after opening, and it was packed with Christmas partying. The beer was, however, excellent, with inventive brews far beyond what English beer used to be . A Berliner Weisse from Magic Rock is a good indicator. Some good Fuller’s pubs in West London, the highlight being the canal side Union Tavern. If you didn’t know this was a Fuller’s House, you would not guess it. 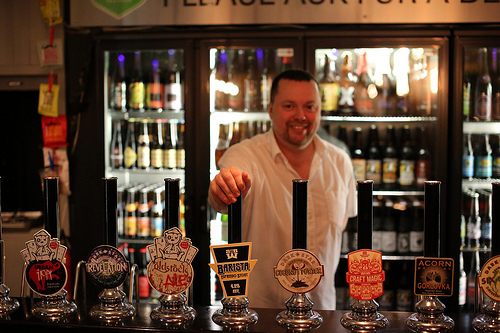 It is really a sign of the changing times that there is a fine range of beers from several London breweries available. And the setting by the Grand Union Canal must be spectacular in the summer. Just a few minutes from Westbourne Park tube station. Alejandro Lovera is an MBA student of the University of Westminster and is currently working on his dissertation project. He tries to measure how responsible drinking campaigns, organic products and other factors can influence the buying decisions of beer consumers. He needs people to fill in a short online servey, which only takes a few minutes. I’ll ask him to pass along the results when they are ready. Help him out, please. If you thought the British beer scene was all quiet pints and cobwebbed pubs, you obviously do not follow Melissa Cole’s blog. She did not like what BrewDog has to say about other british brewers in a recently published book, feeling that BrewDog owes the industry as a whole a bloody enormous apologyy. It wasn’t exactly a big surprise that they don’t feel the same way. Looks like James is able to stock up on new anecdotes to use when doing Meet the brewer tours. And we also don’t work for Satan. 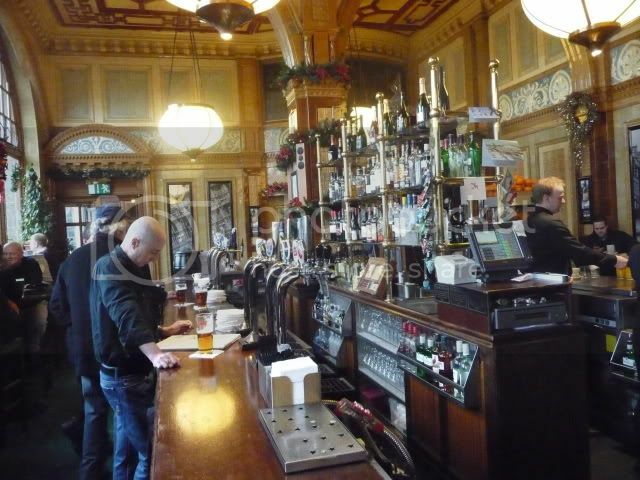 There used to be one good pub at Euston station, the Head of Steam, featuring beer from a range of breweries. This was later taken over by Fuller’s, renamed the Doric Arches and the ale range has gradually shrunk. It is probably still the place to go if you want to have a proper meal before or after your journey, and there is nothing wrong with a pint of London Pride. When it comes to the beer range, you don’t have to go far to find a world class bar. Sure, you can call it a pub if you prefer, but in this tiny building, which looks like an old gatehouse for the station, they have crammed in a range of beers from around the globe that would impress the most spoiled beer drinker, but there is not much to associate with a traditional English boozer. Dozens of cask and keg beers from breweries like Thornbridge, BrewDog and Otley plus interesting Continental and US beers. And if that isn’t enough, there are fridges full of temptations. The bottles are available for takeaway, too, so your journey does not have to be boring, despite delays. It is very tiny, but there is seating up some rickety stairs and even some places outside. 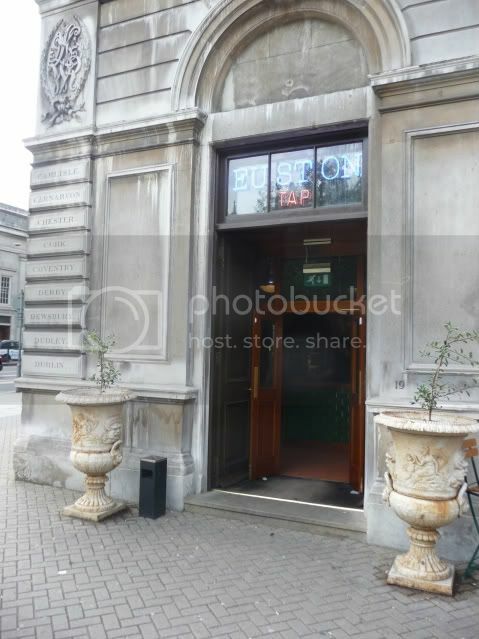 I went on a Sunday lunchtime when it was blissfully quiet, but I assume this place is packed on weekday evenings.